Your cooperation is needed to keep our students' arrival and departure safe. 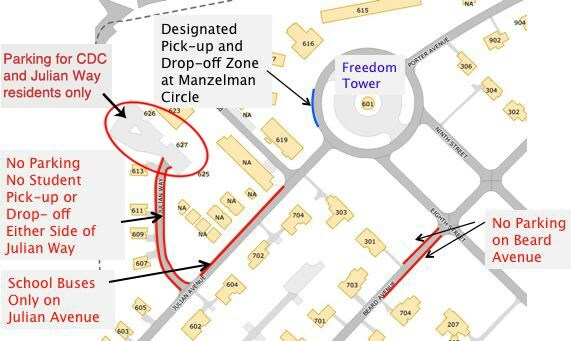 Drop-off/pick-up for all students is located on the curbside of Manzelman Circle fronting the walkway that leads to the cafeteria. Students in the first five vehicles are allowed to exit their vehicles on the curbside. Other areas on campus are prohibited for drop-off/pick-up for safety reasons (i.e. : Radio Road, Child Development Center). The bus stop is located on Julian Avenue near the portable classrooms. Please understand that the parking area within the Freedom Tower lot is for Hickam Elementary staff, with five spots in the front allocated for visitors. When others are parked in the lot, that can make it difficult for teachers to find parking elsewhere and get to their classrooms on time. Please understand that the parking area within the Radio Road lot is also for Hickam Elementary staff. We are expecially concerned with moving cars in an area with frequent students' movement. Thank you for your cooperation and assistance in making the first and last minutes of the school day safe for our students.